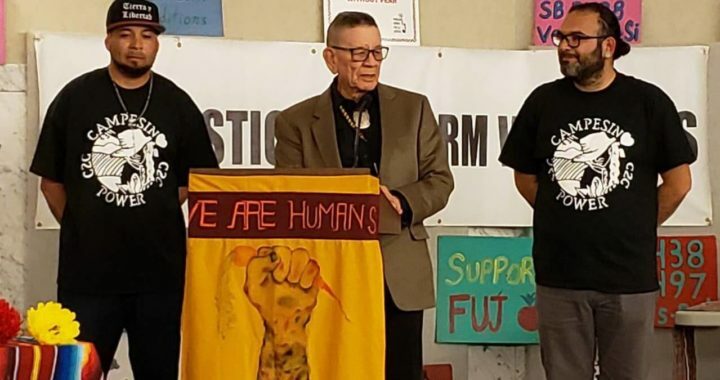 Ramon Torres, President of Familias Unidas por la Justicia Farmworker Union, WA Senator John McCoy, and Edgar Franks, Organizer with Community to Community, at the March 18 Farmworker Tribunal in Olympia, WA. BELLINGHAM, WA April 12, 2019 – Thursday afternoon, the Washington State House of Representatives cast their votes for SB 5438, “Concerning the H-2A temporary agricultural program” a bill that would fund the establishment of an office specifically tasked with monitoring labor, housing, and health and safety requirements for farms using the H2A visa program, as well as prioritizing outreach to domestic farmworkers prior to using the H2A program. SB 5438 passed the State Senate 26-21 in early March. The final House vote on Thursday was a unanimous 96-0, demonstrating that Members of WA State House are listening to the life-and-death concerns of farmworkers on temporary work visas who help sustain the state’s agricultural production. Now the Bill moves to the Senate for concurrence with the House to arrive at the final version for Governor Inslee to sign into law. “This is not the original bill we wanted, but it is still a viable process that will help us fight for justice for farmworkers that are here already in Washington state but also protect the 30,000 guestworkers the growers are planning to bring in. Ultimately what we hope for is a food system that works for everybody,” said Rosalinda Guillen, Executive Director of Community to Community Development (C2C). Integral to this win along the way toward enacting this legislation, was bringing farmworker voices to Olympia and the floors of the Senate and House. 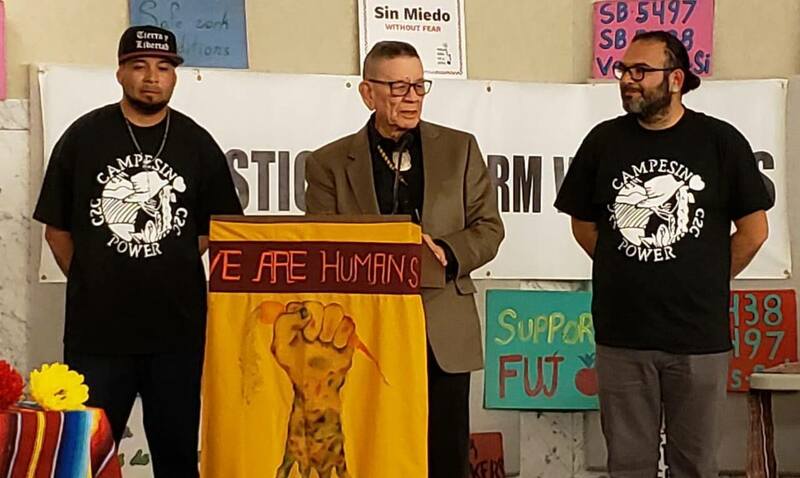 C2C and Familias Unidas por la Justicia (FUJ) have been demanding oversight of the controversial H2A program due to H2A workers reaching out to state agencies about abuses and getting insufficient responses. Throughout the legislative session, C2C and FUJ brought farmworkers from Whatcom and Skagit Counties as often as three times a week to testify about their lived experiences. Before SB 5438 moved to a vote in the House Committee on Labor & Workplace Standards, C2C and FUJ held their annual Farmworker Tribunal at the capitol where farmworkers, including youth ages 11 and 17, spoke about the conditions they live and work in that negatively impact their health, education, their ability to sustain income for their families, and ultimately entrenches a food system rooted in exploitation. They also addressed these issues with farmworker-led solutions to pesticides and climate change. Corporate farms in Washington that contract H2A workers, primarily from Mexico, have a proven track record of wage theft, dangerous working conditions, including exposure to toxic pesticides with serious health risks, and workplace retaliation. “This isn’t the end of the fight for farmworker justice, this is one small piece. Testimony at this Tribunal shows us that we still going to work to protect workers from pesticides, wage theft, and all the other abuses that exist. But today we have to celebrate this,” reflected Edgar Franks, Farmworker Organizer with C2C. SB 5438 is not the end-goal, but it sets up necessary State funding to ensure that WA State farmworkers are protected and that they are represented in the oversight process by increasing hiring of domestic workers. “ Farmworkers in our community are ready to work and need these jobs, we believe that there is not a shortage of farmworkers in the state, and if there ever is a shortage, the union is ready to work with the growers to find needed labor .” Said Ramon Torres, President of Familias Unidas por la Justicia.